WASHINGTON — The Education Department wants to narrow the scope of civil rights investigations at schools, focusing on individual complaints rather than systemic problems, according to a document obtained by The Associated Press. Under the Obama administration, when a student complained of discrimination in a particular class or school, the education agency would examine the case but also look at whether the incident was part of a broader, systemic problem that needs to be fixed. Proposed revisions to the department’s civil rights procedures, distributed last week among civil rights officials at the department, remove the word “systemic” from the guidelines. The changes would also allow schools a greater say in how a case is handled, compared to the student or parent who filed the complaint, and would eliminate the appeals process. The document is only a draft; a final version is expected to be published next year after suggestions and proposals from staff. The action comes as the Trump administration looks for ways of streamlining the work and trimming the budgets of many federal agencies. The administration has called for a $9 billion, or 13.5 percent, cut to the education budget, which would mean the loss of more than 40 employees out of about 570 at the agency’s Office for Civil Rights. The Education Department did not comment on the proposed document Wednesday. Seth Galanter, former principal deputy assistant secretary for human rights in Obama’s Education Department, criticized the proposed revisions, saying the civil rights office’s key mission is to identify and solve systemic problems. Galanter gave an example of a complaint stemming from a white and a minority student getting into a fight, but the minority student being disciplined more harshly than the white student. Under the previous procedure, OCR would examine that particular case but also look at whether that teacher, school or school district was engaging in other similar discriminatory behavior. Another proposed revision would allow the school or school district to negotiate a resolution agreement with the agency before any findings are released to the parent in a letter. Galanter said that was cause for concern because the parent was being kept in the dark. “The letter may still reach the same result, but it may be completely diluted of any fact that would inform the parent and the community about what’s going on in the school,” Galanter said. Miriam Rollin, director of the National Center for Youth Law, said those changes, coupled with eliminating the appeals process, were bad news for students. “School deficits will be held accountable less for violations and parents will have less opportunity to get justice,” Rollin said. 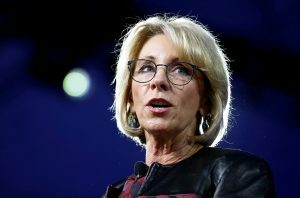 But Rick Hess, director of education policy at the conservative American Enterprise Institute, praised the revisions, saying Education Secretary Betsy DeVos was seeking to fix the Obama administration’s tactic of using the agency’s civil rights investigations to push policy. “What the Department of Education is talking about is wholly sensible and is an appropriate and totally unsurprising correction to what the Obama administration did,” he said.